Toro’s Custom Command hybrid controller is designed to meet a wide variety of sophisticated watering requirements. Available in models ranging from 12 – 48 stations with four independent programs, 16 total start times and a 365-day calendar for odd/even day scheduling. 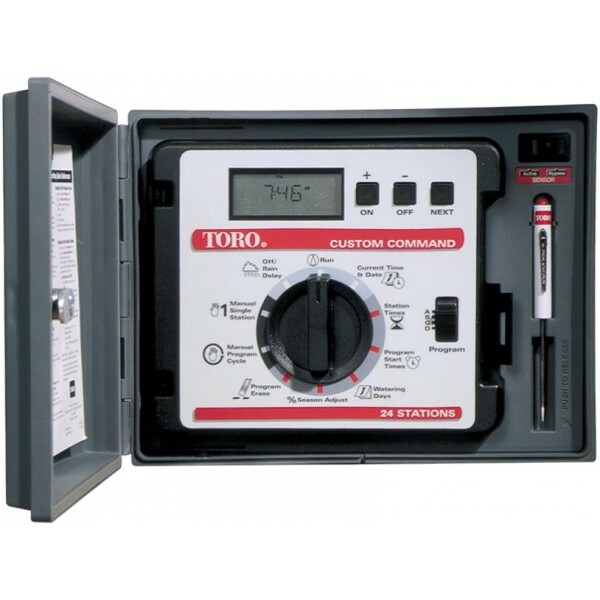 Although advanced, the Custom Command’s proven hybrid design with a large, easy to read display and colour-coded, 10 position dial, ensures easy programming. Versatile Run times: Run times from one minute to ten hours in one-minute increments meet the needs of standard or drip applications. Independent Programs: Four fully independent programs and 16 start times that can run concurrently with start time overlap protection within each program. High Surge Protection: Highest surge protection in its price range for lightning-prone areas. Metal or Plastic Enclosures: Available in wall-mount metal cabinet with optional metal pedestal, or wall-mount plastic cabinet.